Coloured contact lenses provide a quick, easy and inexpensive way to temporarily alter your natural eye colour. 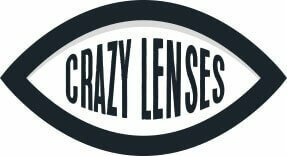 Whether you are after a natural enhancement or a gruesome transformation, Crazy Lenses has amassed a range of circa 350 unique designs spanning categories like Halloween Contact Lenses, Cosplay, Anime, SFX and Natural. Worn by award-winning special FX artists, high-profile Instagram models and A-List celebrities, our coloured lenses are also frequently used by high-profile TV and movie production companies. Coloured contact lenses are identical to the clear prescription lenses that you can buy from an optometrist, but with the addition of a printed design that sits on the outer facing surface. In non-prescription form they can be worn to enhance or transform your natural eye colour. Meanwhile, in prescription form they can be used to improve vision too. Over recent years there’s been an influx of, low quality, cheap coloured contacts from places like China and Korea. However, At Crazy Lenses, we only stock UK Manufactured soft lenses, a high quality, yet cheaper and more comfortable alternative to hard lenses, they now account for 90% of contact lens usage in the USA. Meanwhile, the printing process takes place in sterile conditions and involves the use of strong patented pigments, all of which are FDA approved and compliant with the EU Cosmetics Directive. Coloured contact lenses can be worn safely for up to 8 consecutive hours. However, they shouldn’t be worn overnight. Instead, the lenses should be removed and stowed away in a solution-filled, air tight container. 1. Do sterilize coloured contact lenses before use. To avoid infection and damage to the eye, soak your lenses in sterile solution before and after use. We recommend Eye Fusion Multipurpose Contact Lens Solution for this. 2. 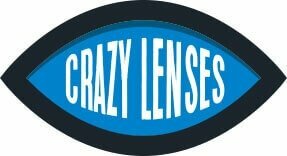 Don’t wear multiple lenses in one eye. People often assume that they can wear coloured contact lenses over the top of clear prescription lenses. However, this shouldn’t be done under any circumstances. Wearing multiple pairs of lenses at once is likely to cause irritation at best. Meanwhile, the more severe consequences can be a scratch to the cornea and even blindness. 3. Don’t wear coloured contacts if you have a pre-existing eye infection or have recently had eye surgery. If you’ve recently had an eye infection, injury or have undergone eye surgery, you should refrain from wearing colour contacts until you’ve consulted an optometrist or eye doctor for advice. 4. Don’t wear ripped or damaged coloured contact lenses. Wearing a ripped or damaged contact lens can be extremely dangerous as it can lead to fragments breaking off and becoming lodged in the eye. It’s therefore important to handle your coloured contact lenses with extreme care, avoiding contact with sharp objects such as finger nails.